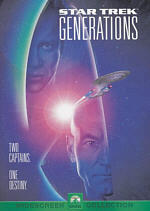 The excitement of Star Trek continues with the series Star Trek: The Next Generation. Join the action with Captain Jean-Luc Picard, Cmdr. Will Riker and the crew of the Enterprise-D, as they explore the outer reaches of the galaxy and get swept away by the incredible stories that made Star Trek a phenomenon. The Best of Star Trek: The Next Generation includes the episodes "The Best of Both Worlds (Part I)", "The Best of Both Worlds (Part II)", "Yesterday's Enterprise", and "The Measure of a Man"! The Best of Both Worlds, Part I: The Enterprise receives a distress signal from one of the Federation’s most distant colonies. When they arrive, they find nothing where a town used to be. Suspicions immediately arise that the Borg caused this disappearance. To investigate this event, Admiral Hanson (George Murdock) and Commander Shelby (Elizabeth Dennehy) come aboard the Enterprise. Shelby proves to be very ambitious, and she seeks the position it appears Riker may vacate for the captain’s chair elsewhere. This leads him to question his own decisions, as he doesn’t understand his reluctance to leave the Enterprise. When eventually the Enterprise meets up with the Borg, they provide a peculiar demand: for Picard and Picard alone to leave the ship and come to their Cube. He refuses and battle ensues. Thanks to a tactic thought up by Shelby, they manage to break free of the Borg grasp long enough to escape, where they enter a dense nebula to evade them while they regroup. Eventually the Borg break through, abduct Picard, and set a course for Earth. “Best” lived up to its title and provided one of the series’ strongest episodes. The Best of Both Worlds, Part II: A discussion of the second show’s events would necessarily include spoilers for the first one, so I’ll just refer you back to the synopsis I offered for that episode. Suffice it to say that Best II concluded the tale in a very satisfying manner. Like many Trek programs, it placed the Enterprise in an apparently unwinnable situation against an apparently unbeatable foe, and it requires their collective ingenuity and bravery to save the day. Best II packs a nice combination of cleverness and action. One of the oddest episodes of TNG, Yesterday’s Enterprise finds the Enterprise present at some sort of mysterious time displacement. This moderately alters reality. This Starfleet is at war, and Tasha Yar (Denise Crosby) rematerializes from the dead. Uniforms and ship architecture seem mildly different as well, though the changes aren’t extreme. Guinan senses that things are strangely wrong, but Picard can’t grasp the concept. In The Measure of a Man, cybernetics expert Commander Maddox (Brian Brophy) wants to take Data off the ship and dismantle him for further study. It seems that no one knows how to make more like him, so Starfleet supports Maddox’s efforts to get to the bottom of the dilemma. However, no one on the Enterprise likes this idea, especially since there’s no guarantee Data will be put back together accurately. Data himself also doesn’t want to participate, and he actually resigns his commission when ordered to go. However, some claim he’s the possession of Starfleet, so lawyer Captain Louvois (Amanda McBroom) orders a mini-trial during which the matter will be settled. Parts of “Measure” felt forced, especially due to Maddox’s excessively villainous ways; he insistently referred to Data as “it” and really seemed like an artificial heavy. However, the show offered a thoughtful and rich exploration of humanity and property and it helped flesh out a number of characters well. Most episodes that focus on Data tend to be gimmicky, so it was good to find one with a deeper, more philosophical basis. 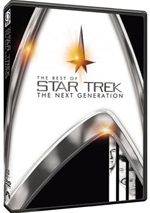 The Best of Star Trek: The Next Generation appears in an aspect ratio of 1.33:1 on this single-sided, double-layered DVD; due to those dimensions, the image has not been enhanced for 16X9 televisions. The episodes looked pretty mediocre. Sharpness came across as somewhat erratic. Most of the time, the picture looked fairly distinct and detailed, but that varied during many occasions. Not surprisingly, wide shots seemed the most problematic, but even close-ups remained inconsistent and could appear moderately soft. Shimmering and jagged edges showed up periodically. Edge enhancement created some minor concerns. As for source flaws, I noticed a few speckles and marks, and the shows could be a bit grainy. Colors appeared up and down as well. At times, the colors looked nicely rich and distinct, but they also came across as dull and murky for parts of the shows, and some red light was somewhat runny. In general, the hues were acceptable but unspectacular. Similar elements marked the black levels, which seemed reasonably deep much of the time, but they also could be a bit muddy on occasion. Shadow detail tended to be somewhat murky. Shots could come across as heavy and flat at times, though the images stayed fairly solid. Overall, the episodes deserved a “C+” for their visuals. The TNG episodes offered Dolby Digital 5.1 soundtracks. The soundfields of the various shows seemed pretty engaging. The forward spectrum dominated, and it offered fine stereo imaging for the music as well as a strong sense of atmosphere. The front speakers provided a clear and vivid environment, and various elements like ships and phaser fire panned cleanly across the channels. Planet environments often came across nicely, as they offered lively and engaging audio. For the most part, the surrounds offered general support of the front speakers. The back channels mostly gave us a good sense of environment, and they also added musical support. The 5.1 mixes didn't reinvent the wheel, but they opened up the tracks nicely. No real extras show up here. 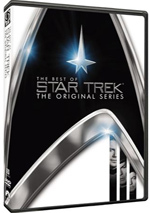 The disc opens with ads for Star Trek – The Original Series: Season One, Charmed and a few other Trek releases. These also appear in the Previews area. Does The Best of Star Trek: The Next Generation live up to its billing? Maybe. I don’t know if these are the absolute greatest episodes of the series, but all are quite good. The DVD presents mediocre visuals, solid audio, and no extras. This is a decent sampler for casual fans.